The Utrecht “St Mary’s Place” (Mariaplaats) has recently been reconstructed. Much more than before the street is now designed for people. First of all for people walking, but the design has also improved the street for people riding a bicycle. The space for cars has been reduced to a roadway of just 5.5 metres wide, that pedestrians can easily cross at any location. The rest of the street, which is almost 24 metres wide, is for other functions than the flow of motor traffic. 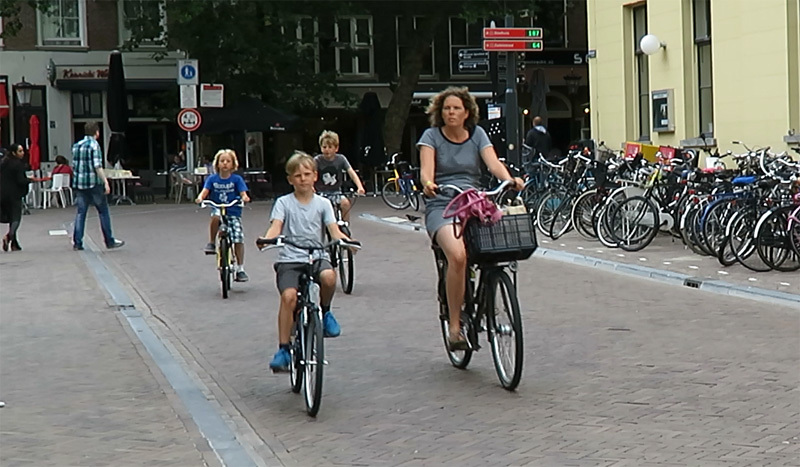 This woman cycles safely with three young boys in the reconstructed St Mary’s Place (Mariaplaats) in Utrecht. 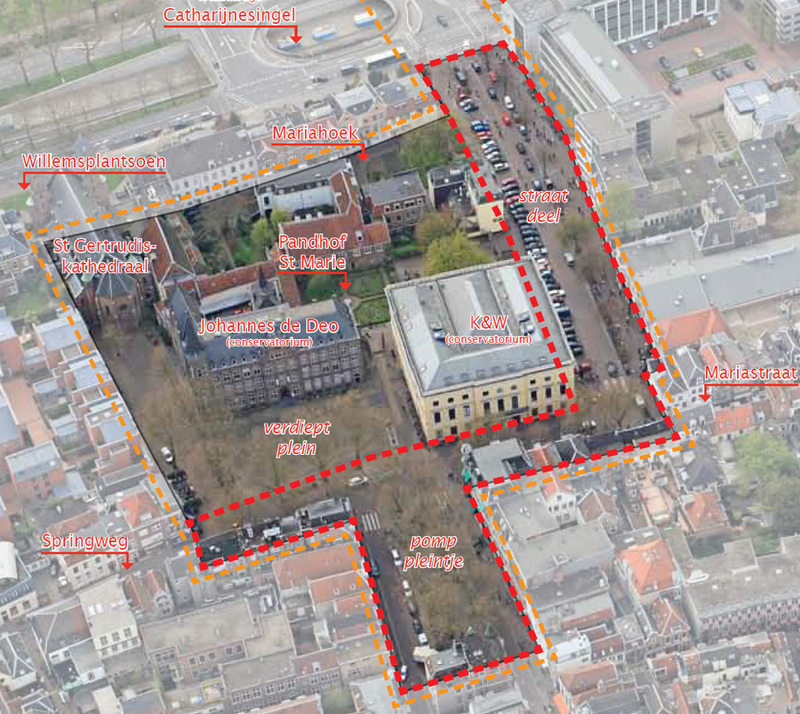 This reconstruction is part of a much larger plan, the “Pilot Openbare Ruimte Centrum” (Pilot Public Space in the City Centre) in which much of the historic Utrecht city centre is updated to be in line with the latest views and policies with regard to traffic and designing public space. The plan from 2012 is for 5 years and it involves investing 27 million Euro in the city centre’s public space. Utrecht has decided that the private car is no longer the dominant form of traffic in its city centre. Something that is already quite clear, as Mark Treasure described so beautifully just last week, but the city feels the design of the streets needs to reflect that even better. 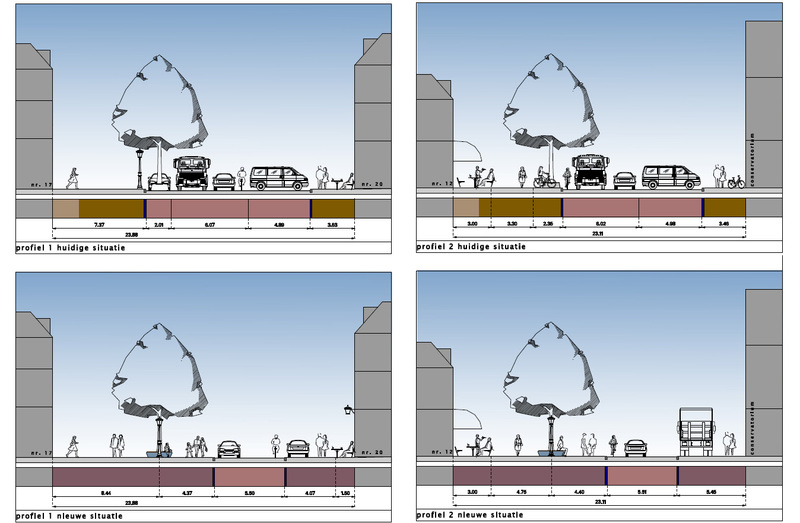 That is why many streets are, or will be, reconstructed with a lot less space for cars. 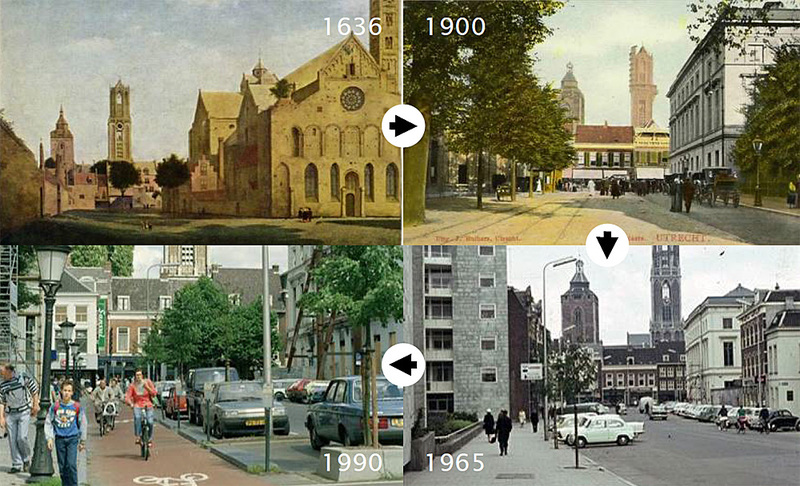 I have shown you two other examples of streets that were previously changed under the same plan: Domstraat/Korte Jansstraat and St Jacobsstraat. The project for St Mary’s Place (Mariaplaats) was made public in June 2013, when the public consultation started. The actual reconstruction took place earlier this year, from February to June 2015. The city council wanted the street to be finished before the start of the Tour the France this summer. After the holidays, a second stage of the reconstruction was executed and now there are still some last details to be finished. 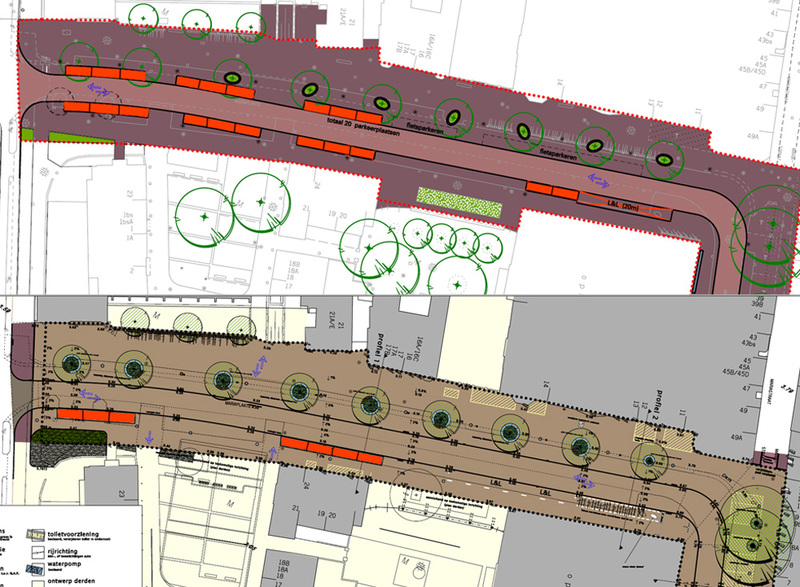 Two cross sections of the street design. Above, before the reconstruction and below after the reconstruction. Clearly visible is how much the space for motor traffic was reduced. The trees (planted in the early 1990s) could remain. Picture from the final design of the city of Utrecht. In November 2014, the Mayor and the aldermen informed the Council Commission for Public Space of their decision about the final design for this street in a letter, published on the city’s website. The decision was made after thorough consultation with stakeholders such as residents, shop keepers, restaurant owners, bar keepers and owners of office space in the area. The letter summarised the entire process quite nicely so I translated a part. “The many discussions have led to a shared vision of the desired end result: St Mary’s Place should be a benchmark in the historic city centre, *the* entrance to the Southern part of that centre from the Central Railway Station. 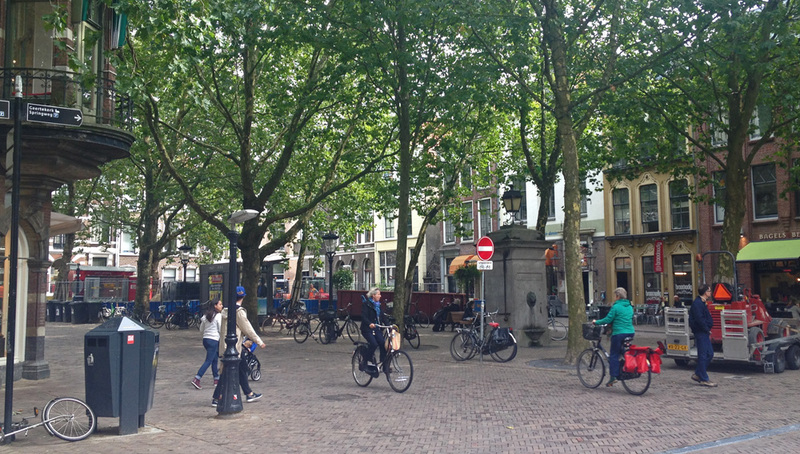 St Mary’s Place has everything Utrecht has to offer in a nut shell: lively busy routes and quiet green spaces, away from the bustling city. To make this visible the pedestrian has to be the most important road user. This can become clear from wide pedestrian areas and other areas where people want to stay, such as outside cafés and benches on squares and in public gardens. People cycling must get a clear place with sufficient space and the car must be a guest. This shared ambition can be achieved by widening the sidewalks, reducing the number of on-street public parking places (with the exception of places for special interest groups), and by making agreements about deliveries of goods. This will make the motor vehicle less dominant in the street and it will at the same time make the street safer for people riding a bicycle. This ambition was articulated in a concept “Programme of Requirements” and a “Functional Design” in direct collaboration with stakeholders. In this phase we held elaborate discussions in two public meetings about a variety of topics such as the location of outside cafés, reducing or rather increasing the number of trees, bicycle parking possibilities, deliveries and car parking. The biggest surprise for many in all this was the fact that the stakeholders wanted to remove all on-street parking places! Imagine that, shop keepers who don’t want parked cars in front of their shops, but rather people walking. Not very common, to say the least. But these entrepreneurs have the very successful pedestrianised shopping area right around the corner. They know perfectly well that it is the pedestrians who come to spend money, not the people parking their cars. There had been 68 parking places here: 55 public parking spaces, 4 spaces for the handicapped, 2 spaces for electric cars, 1 space for a shared car and 6 taxi stands. All the public on-street parking places were indeed removed. The city had first planned to keep 20 parking places, but after the demands of the stakeholders only 7 ‘special interest places’ were implemented in the final design. In exactly the same numbers as before: 4 spaces for the handicapped, 2 spaces for electric cars and 1 space for a shared car. St Mary’s Place is not really a place, or square. It is a collection of smaller and larger streets, alleys, passages, little squares and public gardens, all on the grounds of the former St Mary’s Church. This church was already demolished in 1813. All that remained of the church is the cloister garden, so nicely photographed and described by Alison on her ‘A Flamingo in Utrecht’ blog. Today the location of the former church forms the entrance from the modern Central Station Area with its 1970s mall to the historic city centre with its museum quarter. A lot of people walk and cycle here and their number will only increase after a bridge for walking and cycling over the rail road tracks will be opened next year. A main route for cycling through the city centre also runs through St Mary’s Place. At the exact same location in 2015 there is not a car in sight. This is people’s space. In the background you can see that in this corner of St Mary’s Place (Mariaplaats) the reconstruction is still going on. For cars the place gives access to a big mistake from the 1970s: a public parking garage for 1,000 cars in the middle of the historic city centre. The planned wide access roads to that garage were never built, so the traffic flow to it has to use St Mary’s Place. The removal of the 55 on-street parking spaces will not reduce the traffic flow much, but it will eliminate the parking movements. Cars pulling in and out of parking spaces can be dangerous for cycling. So their removal makes cycling safer. It also makes the flow easier, not only people cycling, but also other cars were held up by those parking movements. The street part of St Mary’s Place (Mariaplaats). So much space allocated to walking and cycling makes it a really attractive place. The high quality street furniture and the mature trees, which could remain where they already were, give it an extra nice look and feel. A good solution was found for delivery vehicles. During the day there is a large enough bay for trucks to be unloaded and sometimes loaded with goods that need to be transported out again. At night the same bays are taxi stands. In The Netherlands you cannot simply stop a taxi in the street, that is illegal. You need to call a taxi to come to a specific address or you can go to a place where taxis wait for customers. Here, in an area with a lot of restaurants and bars, there is a bustling night-life and thus a demand for taxis. The combined space for trucks and taxis is on the side-walk. This has the advantage that when there are no vehicles parked, the space automatically becomes pedestrian space again. Aerial picture of St Mary’s Place. Really a wide range of different types of public space. A challenge for good urban design, but I think the new situation is a real improvement over this former situation. The pedestrian after all, is the main user in this area of the city. The side-walks were widened from about 7 metres wide to 10 to 13 metres wide. The roadway is shared between motor traffic and cycling. The 5.5 metre wide roadway is just wide enough for one car to drive between two people cycling in opposite directions. This makes sure that motorists will not become impatient behind people cycling, but if the roadway would have been a bit wider, then the speeds would go up to an unacceptable level. So the width is just right. It is allowed to cross the street as a pedestrian, wherever you might like to do that. Just like in Domstraat/Korte Jansstraat the city wants to make it as easy as possible to get to amenities at either side of the street as conveniently as possible. It may not come as a surprise that the concept of ‘jaywalking’ is completely unknown in The Netherlands. With only few exceptions, the Dutch are allowed to cross streets where they like. The contrast to the situation before 1990 is enormous. At that time much of the street’s width was allocated to the private car. Lateral parking on both sides of the street and enough space for higher speeds for motor traffic. In those days the speed limit in cities was 50km/h everywhere. In the late 1980s the city tried to improve the situation by building a cycle track. This was even improved in the early 1990s with a surface of smooth red asphalt. But the cycle track was gone again early in the 21st century. Under the Sustainable Safety policies all streets in the country had to be categorised and this street was to be place and not for traffic flow. That meant the speed had to go down to 30km/h and separated cycling infrastructure became unnecessary, unwanted even, so the cycle track was removed. If only we had looked at street functions earlier, then this unnecessary cycling infrastructure would not have had to be built. A waste of time, money and resources. Now, 15 years later, another step was taken into the process of really making this a people’s place, also in the street design. Phasing the car further out of the city centre is part of that process. Cars don’t belong in historic city centres. They are too big, too noisy, too polluting and too dangerous. 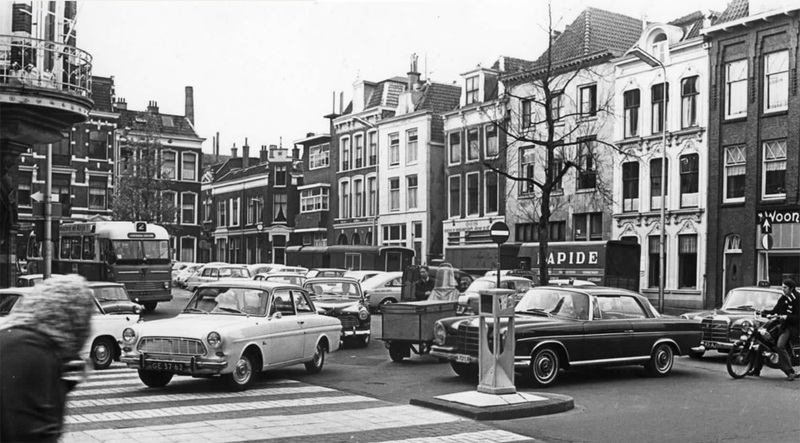 It has become increasingly clear that the car has had its time in many of the Dutch city centres. Rightly so and this will only become more common in the time to come. Cities are for people, not for traffic. Didn’t residents complain about the removal of car parking spaces? Where do they park now? This seems the major obstacle to me in this kind of projects. If you read the post carefully you see that residents (together with local business owners) actually *asked* for more parking spaces to be removed! This even surprised me a bit, but I think that many local residents actually do not own cars, or they have private parking spots within their buildings. For example, I have friends who live just around the corner from there who sold their private parking spot to a business owner because they didn’t use it. Yeah, ok, what I meant is that the removal of car parking spaces obviously makes parking the car more difficult at least for some of the residents that used to park there. So, why do residents in general are in favour of removing those parking spaces? (in this particular project). – The majority of residents didn’t want car parking, so they “won” over the minority that did want. – The city compensated the residents with free parking elsewhere (maybe in that underground parking?). – Even if residents lose parking space, the net benefit for them is still positive maybe because the loss is not so great (parking elsewhere nearby? private parking?) and they perceive the new situation as an improvement (their street is now more livable or whatever). I find this point very important because in the cities I know well here in Spain the city always gives free or mostly free parking to local residents when pedestrianizing areas. If it didn’t, resident would be totally against the projects. So it would be great to know how this is handled in the Netherlands! You forget a possibility: Most residents might not own a car. 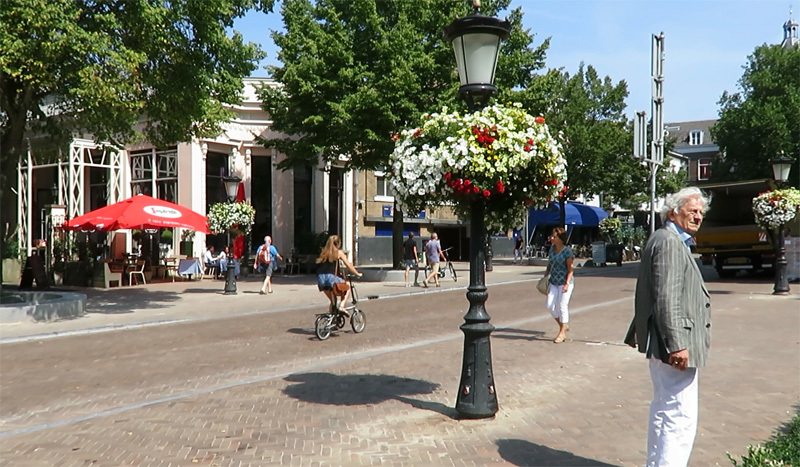 In city centers in the Netherlands, it’s common for car ownership to be below 20%. The minority with a car might get enough ‘residential parking only’ places to cater for their needs. Like most people that live in the city center of Utrecht, I walk or bike where I need to go. Sometimes it’s even easier and faster to walk. To give you an idea of how easy it is to do so, the size of the historic town, that is, what’s surrounded by the canals, is 2 Km in length by 1 Km in width. Most people don’t have cars and those that do park in designated areas for something like 10/month. Visitors have three parking garages they can use. The rest of the city is more car friendly but, unlike those cities of Spain, parking is NEVER free. It’s a culture shift. Replace your car with a bike. 30 seconds into the view from the saddle video, the one numbered 1, you can see in the top right that there is a sign indicating the way to bicycle parking spaces, which they unveiled this year. Would this be considered a woonerf? No, it wouldn’t. This is a street in a 30km/h zone. Woonerven (the plural of Woonerf) are as the ‘woon’ (living) part indicates usually places where the main function is residential. The ‘erf’ part (‘yard’) indicates that that usually is a dead-end street as well. This street is neither. This is a main route to a parking garage for cars. It also gives access to shops, restaurants and bars and even to the city’s conservatory with a lot of music students. Nothing like a ‘woonerf’. Ahhh, thank you very much. I appreciate the explanation. This is really advanced stuff, perhaps brought about by years of incremental changes. I applaud it, but in Los Angeles, such a change overnight would probably cause a revolution. Thanks for the link to my blog. I have some street-level photos from earlier this year that I never got around to posting. Maybe I’ll actually blog again, as I really did like how the area looked without all the cars. What was the price of the reconstruction this year and who footed the bill? And are you able to provide specifics like the schematics of the car parking spaces that remain? I wish to know that so I can tell my city what a car parking space should look like. And even the weather has improved over 15 years, Mark! 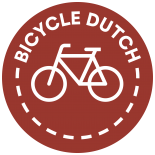 This entry was posted on 22 September 2015 by Bicycle Dutch in Original posts and tagged before and after, history, infrastructure, urban design, Utrecht.